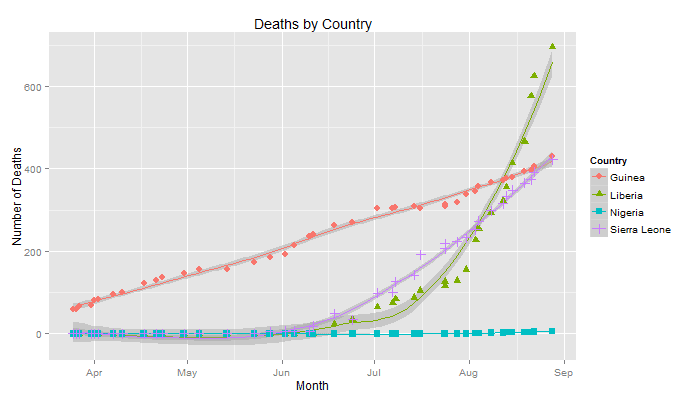 Econometrics By Simulation: 1.2 Million Deaths by Ebola projected within Six Months? 1.2 Million Deaths by Ebola projected within Six Months? The World Health Organization, Samaratins Purse, Doctors Without Borders, and other international medical emergency relief programs are desperately calling for additional resources in the international fight against Ebola that has already killed thousands and is likely to kills thousands more even if a full arsenal of aid was made available. Figure 1: The lines are projected values while the points are data points. The World Health Organization released a statement on August 28th that the epidemic could afflict more than 20,000 people before it could be brought under control. This however, assumes full international backing for an intervention to control the deadly outbreak. Failure to fully support the WHO's plan presumably would cause the disease to continue to spread in a similar manner as it already has. At first a figure as high as 20,000 seems exaggerated especially when looking just at the number of 3,000 cases reported the same day as the announcement. However, I believe that this estimate is vastly too small and is entirely based on an effective and well funded international relief mission. 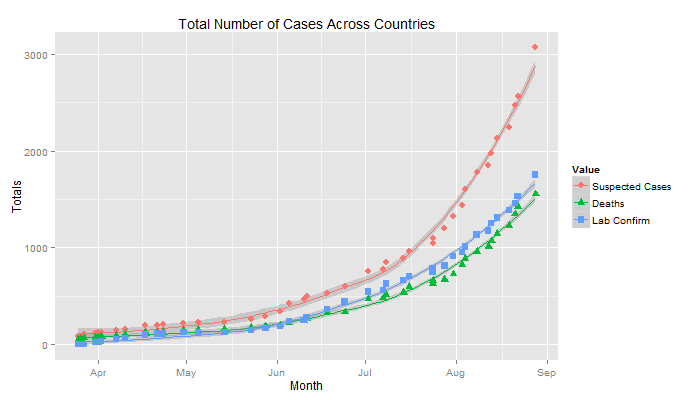 Using a projection from all of the WHO reports to date I calculate that if the disease continues to spread at the rate it currently is then we will have more than 20,000 cases by October 24. The report also states that it will likely take six to nine months in order to stop the epidemic. However if nothing changes and the epidemic continues to rage as it currently does then my projections estimate that as many as 4.7 million people will have been infected and 1.2 million will have already died. These are extremely dire predictions and I hope that they are purely extrapolations based on what will later be seen as the scariest month of this epidemic. However, the exponential growth model fits the data very well and at least in the short term should be expected to be fairly accurate. All of this analysis is done in R and the code can be found on Github. 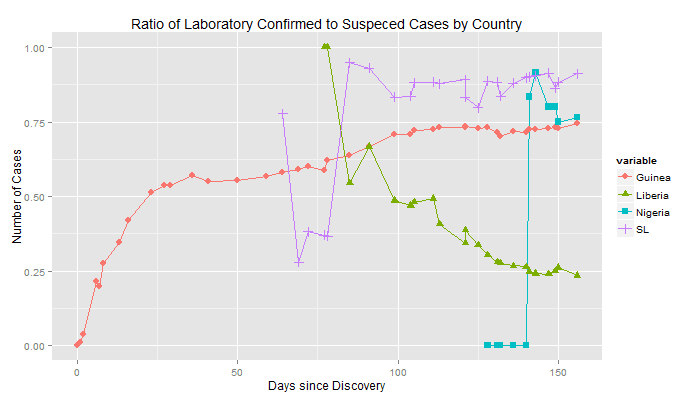 From 41 CDC Ebola reports I have assembled a small database of cases by country listing the number of 'Suspected or Confirmed Cases', the number of 'Deaths' suspected to be associated with Ebola, and the number of 'Laboratory Confirmed' cases of Ebola. You can find and add to this database as a google spreadsheet here. If running the code for yourself it will import the spreadsheet data directly. Mapping this data by country and fitting a local polynomial regression to give a fitted line for each country gives us some signs of a very disturbing trend. The country in which the current outbreak originated is Guinea and though the disease continues to claim new victims it is much less worrisome compared with Sierra Leone and Liberia where rates of suspected cases and numbers of deaths are exponentially growing. Figure 2: The increase of deaths in Liberia is much steeper than the other two heavily afflicted countries of Guinea and Sierra Leone. 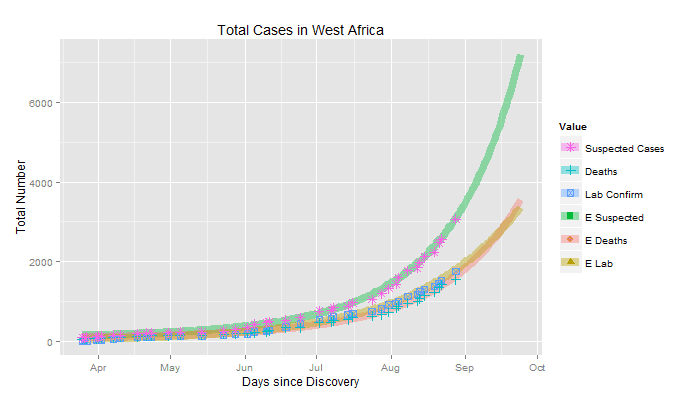 Figure 3: The increase of laboratory confirmed cases in Liberia is much less steep than the increase is deaths indicating that the poor medical infrastructure is not able to keep up with the number of diagnoses demanded. Figure 4: The increase of deaths in Liberia is much steeper than the other two heavily afflicted countries of Guinea and Sierra Leone. By exponential growth, we mean that whatever the current number of infected people are, we can expect them to infect some additional number of people proportion to the transmission rate. The problem with exponential growth is that while the inclusion of new victims can initially start out small the more victims there are the more are likely to be added to the victim pool each day. 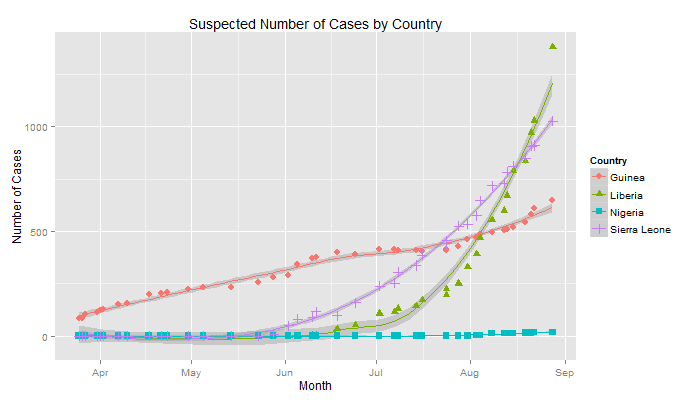 Figure 5: The total number of cases is rising extremely quickly. When we look at the total numbers of each case summed across country we arrive at the above graph. From this graph it is clear that a direct linear model cannot fit well at all. Suspecting that the change over time might fit an exponential growth function, I take the natural log of the values mapped above. Figure 6: A log transformation of the total number of cases creates a relatively linear relationship between time and number of cases reported. While intercept estimates are generally considered to be less important the coefficients on Day can be directly interpreted as percent changes by day. Thus we can expect from the current data that each day we will have a little over 2% additional suspected cases, deaths, and laboratory confirmations. In order allow for the model to be a little more flexible in my projections I include a slightly more complex model including a squared term for the days since announcement. I use this model to project suspected cases, deaths, and laboratory results for the next three weeks. The values up until today show the comparison between the expected values estimated from the model (EDeaths, ESusp, and ELab) with that from the data (Death, Susp, and Lab). We can see the model fits the data quite well with all estimates within 100 of the observed while most are much closer. Using this model we can see that the total number of deaths is expected to be around 3,500 by the 24th and 7,200 suspected cases. Things just get worse from there. This model by definition cannot be true globally (into the distant future). This is obvious when we use the model to project out to one year. At one year the number of infected cases is estimated as 436 billion. Since the entire population of the Earth is only 8 billion or so we know that this cannot be true. However, this kind of model can be a good approximation locally (in the near future). If it is a good approximation locally then the next WHO report is going to list around 2100 deaths and 4060 suspected cases as of today. So, I ask the question, "is 1.2 million deaths a projection which is either local or global?" I cannot answer this, but it certainly is within the realm of feasibility since the nation of Liberia alone has over 4 million people and Guinea 10 million and Sierra Leone 6 million. The real question becomes, "do we think the ability of Liberia and other afflicted nations to control the spread of Ebola will increase, decrease, or remain the same over time?" Figure 7: Shows the relationship over time between number of laboratory confirmed cases and suspected cases. If a country is able to apply effective diagnostic tools then this ratio should be high. In most countries we are seeing a rise in the ability to diagnose Ebola except in Liberia where there is a steep decline. 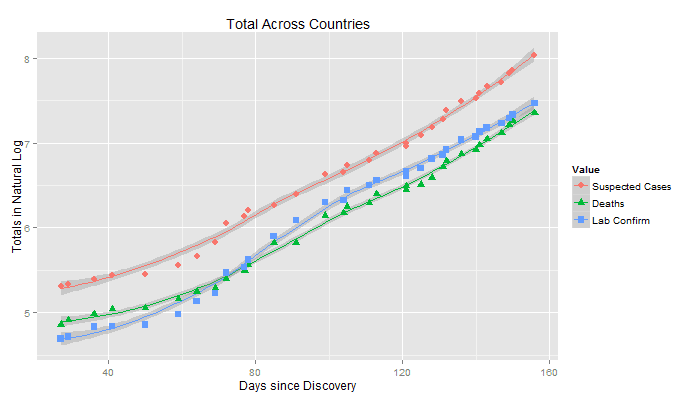 From Figure 7 we can see that Liberia is significantly behind other nations in its ability to diagnose Ebola. This and the well known lack of medical facilities suggests to me that as the crisis escalates the ability of Liberia to maintain any sense of order and with it any hope of controlling the spread of the disease is likely to degrade. If this is the case then it is quite possible that even this horrifying projection is an underestimate of the pain and carnage likely to result from this outbreak. News reports and the governments they are reporting on seem to have been placing a good deal of emphasis on investing in vaccines and treatment options. However, while all of these options are good, they are long term options (6 to 12 months). In the meantime, every resource available must be used to contain and restrict the spread of this outbreak. It is extremely foolish to think that any nation is immune to this disease. So far in the entire history of Ebola outbreaks up until the present less than 10 thousand people have been infected. This relatively low infection count coupled with rapid mortality makes it unlikely that the disease will significantly mutate among the human population. However, if my projections are anywhere close to accurate then the number of infected people are going to be much higher than has ever occurred previously. This will create many more habitats for which the virus can possible mutate new traits which could increase its transmission rate. These mutations could take the form of longer gestation periods which might lead to a greater time between being infectious and being detectable. Another possible trait might be the ability to go airborne which would significantly increase its ability ability to be transmitted. Some scientists it very unlikely to become airborne because it is too heavy. This may be the case. However, as the possibility of it becoming airborne could result in a global spread of the disease resulting in unprecedented number of deaths world wide it is more than prudent to heavily invest in controlling the number of new patients infected by this disease. In addition, even if the disease does not mutate from the state that it is in currently to a new one, it has shown itself to be extremely effective at being transmitted with a large number of health workers becoming infected and dying from the disease. These health workers should have known how to control the spread of the disease and prevent infection. Do we really expect that if the disease were to enter any other nation on Earth that the general population is going to be better prepared to protect themselves than the specialists who have already fallen victim to this disease? Thus, it is imperative that we do everything within our power to control the spread of this terrible disease. Even if my model only has a ten percent chance of being accurate over the next six months, we would be extremely foolish to risk not responding to this outbreak with every resource within reason humanity can muster. Thanks for your time to do this analysis. Some data could not be related with real date, for example WHO reported 2296 deaths as of 6 sept not 9 sept in your chart. Maybe this change the model? Thanks for your comment Byran. I had difficulty finding the original source of the WHO numbers so I ended up deciding to just drop data points I could not source. Now that there are updated reports that I can directly reference I am happy referencing those. By the way, this does not change my model since the post was written with data only up until August 28th. I will post something again soon with an updated model. Thanks Francis, this is very interesting work. Now that we have a few more weeks of data, how is the model from mid sept holding up? Thank you for a great post! Please keep updating it! When I open http://goo.gl/w64gfp in Google Chrome it opens the list of functions as described. But I am interested to know why the "source("http://goo.gl/w64gfp")" does not work? Modeling is useful in many cases. However, this outbreak is primarily due to cultural traditions. Thus, human behavior is something that models are not able to predict. There have been 24 outbreaks of ebola since 1976, this data would also be useful to consider when making a model, since those outbreaks took place in other countries that do not have the same traditions, thus a more accurate representative of infection rates. Also, as you can now see the high death rates are likely caused by the lack of medical facilities. Those treated in modern facilities are having much higher survival rates. So these are other factors that must be taken into consideration when creating a mathematical model. I appreciate your feedback, but I am confused at to what you are suggesting. Including other factors in the model necessitates the development of an alternative model. In this case, the 24 previous outbreaks were both much smaller in scale and much more localized, resulting outbreaks that were containable given the resources available. Overall, the point of this model is not to explain every Ebola epidemic that has ever occurred but to provide simple estimates of how the epidemic might develop. Ultimately we are constrained by our data. It is not possible to include every possible factor that could explain how this epidemic might have occurred and spread since the data is extremely limited.